Below are polo wraps for sale. Polo wraps are a type of protective leg wrap for horses. Polo wraps are usually made from a soft, flexible material, such as fleece. While polo wraps are used for a variety of reasons they are typically used to protect a horse's legs during such activities as riding, shipping, or when a horse is turned out. They are also used simply as a fashion accessory: They can be very useful to tie a "look" together for an overall, professional appearance. 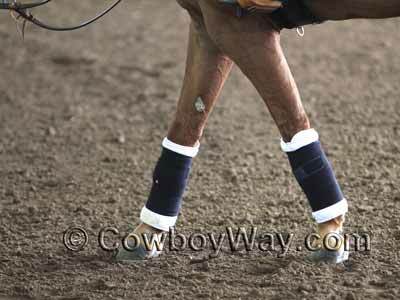 Polo wraps are commonly used both on just the front feet or on all four feet. They are also commonly used alone or with additional padding underneath. The custom made polo wraps on eBay are commonly already made and ready to ship. The seller has already customized the wraps in some way: This could be in the choice of fabric pattern or colors, added bling like rhinestones, or whatever. 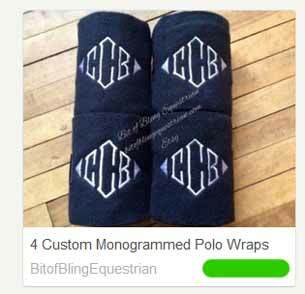 The custom made polo wraps on Etsy might also be already customized and ready to ship similar to the ones on eBay, but on Etsy, you can also often find a seller that will customize the wraps to your specifications: Your choice of colors, bling, monogramming and/or embroidery, etc. Obviously, since you need to tell the seller how to customize the wraps they will not be created until after you place your order so you will need to allow for a longer time period before you receive them. Please scroll down for good things to know before buying polo wraps on Etsy. 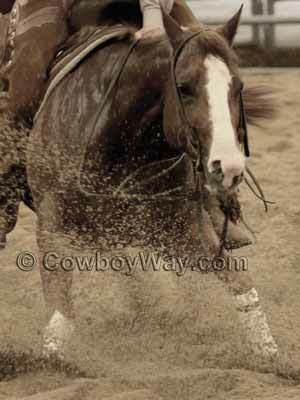 Below: Polo wraps on a cutting horse. eBay and Etsy are both excellent sources to find custom polo wraps. This page lets you compare price and selection from both of them on one convenient page! 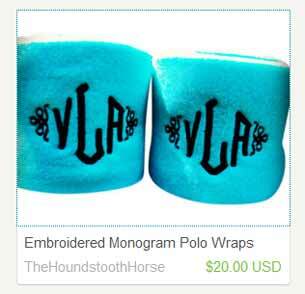 Below is a random selection of Etsy sellers we have found offering custom polo wraps. Or, click here to see all the polo wraps on Etsy (these include both custom wraps that are not made until you place your order, and already made, ready to ship wraps). Remember, most of the polo wraps shown below were made in the past for someone else so the wraps shown will not be available. However, the photo still serves as a good example as to what that Etsy seller can create. TheHoundstoothHorse, located in Ferndale, Michigan, makes customized polo wraps as well as a wide variety of other custom items for horses. They offer a wide selection of colors and thread colors for the wraps, and also offer monogramming. Click here to visit the TheHoundstoothHorse Etsy shop. BitofBlingEquestrian, located in Ontario, Canada, makes customized polo wraps in sets of two or four. They offer a wide selection of colors and thread colors for the wraps, and also offer monogramming. They commonly ship to the USA as well as Canadao. Click here to visit the BitofBlingEquestrian Etsy shop. How many polo wraps do you get? Sets of two and four are both common. Note: On Etsy it is common for a quantity of 1 to actually mean 1 set, that is, 2 polo wraps. Read the product description thoroughly to be sure. What are they made of? Most of the polo wraps we've seen are made of fleece with hook-and-loop (Velcro) closures, but it never hurts to be certain. How big are the custom wraps? Common sizes include widths from 4.5 inches to 5 inches wide by 9 feet long, but sizes can and do vary. Are the customized polo wraps machine washable? How long after you place your order will it be before the seller can make then ship your wraps? Last but not least, if you have any questions about custom polo wraps be sure to ask the seller before you buy! Look for the "Ask a Question" button on the right-hand side of an item's description, to the right of the photo(s). Below: Dark blue polo wraps.